Happiness in every bite! 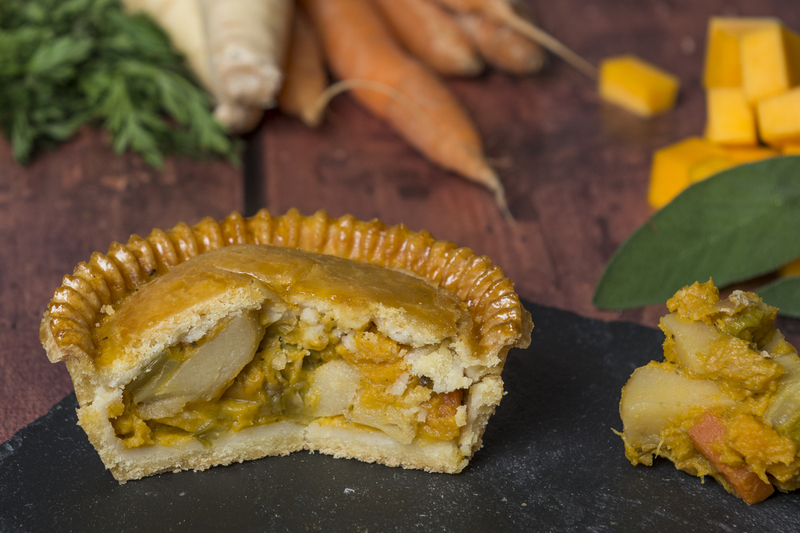 Packed full of delicious root vegetables and served in a generous helping of smooth squash, sage and apple sauce. All wrapped up in our rich, shortcrust pastry. Rice flour (brown and white rice), gluten free plain flour (rice, potato, tapioca and buckwheat flour blend), water, pumpkin, butternut squash, carrot, leeks, parsnip, swede, vegetable oils (sunflower, rapeseed and palm), vegetable fats (palm, shea butter, sal butter), apple, onion, emulsifiers E471, sunflower lecithin, potato starch, maize starch, pea flour, vegetable derived stabilisers, cellulose, methylcellulose, carboxmethylcellulose, guar gum, emulsifier: vegetable derived mono and diglycerides of fatty acids, yeast extract, sugar, onion powder, herbs (parsley, tarragon, sage), spices (CELERY seeds, garlic, turmeric, pepper, parsley roots), agave syrup, tomato puree powder, red pepper, salt, pepper, mono calcium phosphate, sodium bicarbonate, organic corn starch, preservative – potassium sorbate, acid – lactic acid, vitamins (Niacin B6, B2, Folic Acid & B12, flavourings (contains CELERY), maltodextrin, citric acid, caramel syrup, colourings: annatto, curcumin.